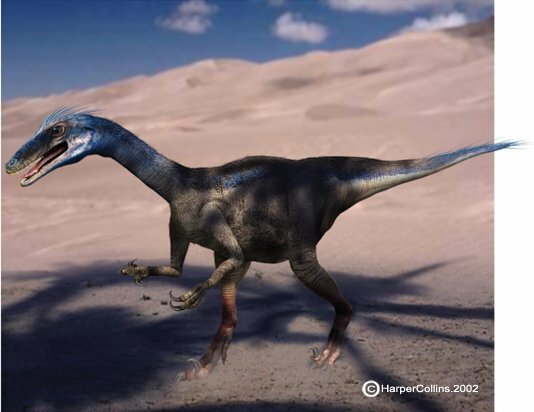 Troodon formosus (from Greek troo - to wound and odon - tooth) was a small possibly maniraptoran theropod dinosaur whose eating habits are still uncertain. This taxon is commonly recognized during excavation from its distinctive small teeth with large denticles along the trailing margin. While the dinosaurs may have ranged upwards to 6 feet (2 meters) in length, many of them must have been the size of chickens or smaller. The teeth we encounter in our quarries and in nearby microsites (localities in which most of the fossils are small, being less than an inch, or 2 cm in length. These fossils are often teeth) are nearly microscopic, ranging upward to a few mm in length. The photo on the right shows one of these teeth. The pin head is 1.5mm in diameter for scale. 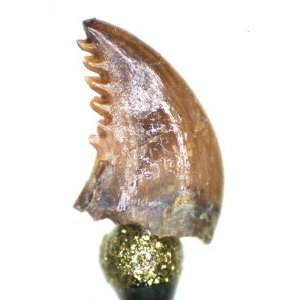 Why the teeth are so small is difficult to understand, unless they are from very young dinosaurs that might have been feasting on the rotting carcasses ofEdmontosaurus.